When the last Cobol programmers walk out the door, 50 years of business processes encapsulated in the software they created may follow. David Brown is worried. As managing director of the IT transformation group at Bank of New York Mellon, he is responsible for the health and welfare of 112,500 Cobol programs — 343 million lines of code — that run core banking and other operations. But many of the people who built that code base, some of which goes back to the early days of Cobol in the 1960s, will be retiring over the next several years. “We have people we will be losing who have a lot of business knowledge. That scares me,” Brown says. He’s concerned about finding new Cobol programmers, who are expected to be in short supply in the next five to 10 years. But what really keeps him up at night is the thought that he may not be able to transfer the deep understanding of the business logic embedded within the bank’s programs before that understanding walks out the door with the employees who are retiring. More than 50 years after Cobol came on the scene, the language is alive and well in the world’s largest corporations, where it excels at executing large-scale batch and transaction processing operations on mainframes. Cobol is known for its scalability, performance and mathematical accuracy. But as the boomer generation prepares to check out of the workforce, IT executives are taking a fresh look at their options. In a recent Computerworld survey of 357 IT professionals, 46% of the respondents said they are already noticing a Cobol programmer shortage, while 50% said the average age of their Cobol staff is 45 or older and 22% said the average is 55 or older. For Bank of New York Mellon, which bought its first mainframe in 1955, keeping the core Cobol applications that run the business on the mainframe makes sense. Modernization efforts have made BNY Mellon’s Cobol-based programs more accessible through the use of Web services and up-to-date user interfaces. But for some noncore applications, and for smaller workloads, organizations have been gradually migrating off of mainframes — and away from Cobol. In some cases, Cobol programs are simply rehosted on Linux or Windows servers; in other cases they’re rewritten in object-oriented languages; and some programs are being replaced with packaged software. “Over the past five years, there has been an acceleration of [some] businesses moving off host platforms,” says Adam Burden, global application modernization lead at Accenture. Often that means leaving Cobol behind by either rewriting it for J2EE or .Net or moving to packaged software. Gartner estimates that the world has seen about a 5% decline in total Cobol code over the past few years. Much of that decline was due to migrations by small and midsize mainframe shops that move off what they see as a legacy language when they retire the hardware, says Gartner analyst Dale Vecchio. Rehosting can get code off the mainframe quickly. One vendor catering to users thinking of pursuing that option is Rockville, Md.-based Micro Focus, whose offerings include a system that will support Cobol programs on a Microsoft Azure cloud. But rehosting is often seen as just an intermediate step on the way to completely modernizing and transforming Cobol systems. A procedural language, Cobol is not perceived to be as agile as object-oriented languages for modern programming needs such as mobile apps and the Web. And despite the availability of state-of-the-art Cobol development environments — including IBM’s Enterprise Cobol on the mainframe and Micro Focus’s Visual Cobol, which integrates well with Microsoft’s Visual Studio development suite for .Net — Cobol is widely viewed as a legacy language. 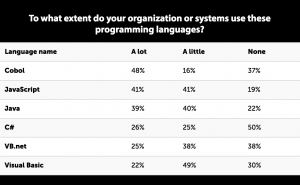 Nearly half (49%) of the respondents to our survey whose organizations don’t use Cobol said the reason is that the language is simply outdated. Not everyone agrees, of course. “Cobol has had lasting value, and it’s not broken,” says Kevin Stoodley, an IBM fellow and CTO of enterprise modernization tools, compilers and security at IBM. In the more recent survey, over 50% of the respondents said that Cobol represents more than half of all internal business application code. “There has been no renaissance for Cobol,” says Accenture’s Burden. “There’s not a whole lot of new development going on. 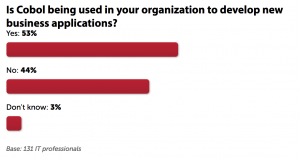 But our clients are enhancing their core applications and continue to maintain them.” Indeed, 53% of the respondents said that they’re still building at least some new business applications in Cobol. The vast majority of that code is still being written for mainframes. But the fact is that many IT organizations don’t have much choice but to continue using Cobol. Migrating large-scale systems built in Cobol is costly and risky. “They might want something more flexible, but they just can’t do it. They’re captive to Cobol,” Burden says. The down economy has helped put off the inevitable, says Compuware’s Vallely. “Economic issues provided everyone with a hall pass because not as many folks were looking to retire,” he says. But as the economy improves, retirement plans may pick up too. “Organizations are trying to be more proactive,” he adds. “No other language has seen as big an impact from changes in the demographics of the workforce as has Cobol,” Vecchio says. Going forward it will become more difficult to maintain a Cobol portfolio. “The inflection point will come when enough Cobol programmers have retired that an organization can no longer tolerate the risk,” he says. At that point, most of those programs will migrate — but not all. For BNY Mellon, those Cobol batch and transaction processing programs on the mainframe represent an enormous investment. And while Gartner says it’s technically possible to move mainframe workloads of up to 3,000 MIPS, the workload at the bank, which relies heavily on Cobol, consumes 52,000 MIPS of processing horsepower, spans nine mainframes and is growing at a rate of 10% each year. “The business wants us to make investments in programming that buy them new revenue. Rewriting an application doesn’t buy them any value-add,” Brown says. Where do you find Cobol programmers these days? 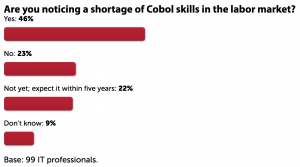 College graduates with training in Cobol are in short supply. In Michigan, for example, state schools that offer Cobol programming have cancelled classes because of a lack of interest. “They can’t get anyone to enroll,” says Jonathan Miller, director of information systems and services for the government of Michigan’s Saginaw County. But some colleges are still providing Cobol training — with help from IBM. The mainframe vendor has developed curricula in association with more than 80 colleges and universities ranging from Brigham Young to Texas A&M. “We donate hardware and software, help with the curriculum, and they graduate hundreds of people every year,” says Kevin Stoodley, an IBM fellow and CTO. Guardian Life Insurance has recruited Cobol programmers from Workforce Opportunity Services, a nonprofit that collaborates with business clients and local colleges to train economically disadvantaged students to fill less popular technology disciplines such as Cobol programming. “They take kids from disadvantaged neighborhoods and provide them as consultants,” says former Guardian CIO Frank Wander, who now has his own consultancy, IT Excellence Institute. “It’s sort of a work-study program. We have over 200 consultants today in five states, and we’re expanding,” says Workforce founder Art Langer. 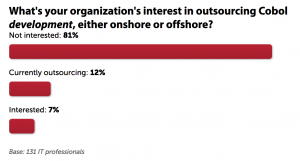 BNY Mellon and many other organizations also increasingly rely on outsourcing firms to pick up maintenance and support duties. But for many customers with mission-critical applications, an offshore locale is not the place to keep the institutional knowledge of the business rules behind the code. David Brown, managing director of BNY Mellon’s IT transformation group, says the bank wants those skills in-house. Fortunately, it’s not all that difficult to cross-train programmers in Cobol. “Right now, it’s pretty easy to hire programmers, and if they understand Java I can bring them back to procedural languages like Cobol,” Brown says. The trick, he says, is to develop a curriculum that teaches not just Cobol, but the business rules behind the code that runs the company. “We need to make sure we can roll that forward,” he says. Other functions, such as general ledger and reporting, are moving onto distributed computing platforms, where they are either replaced by packaged software or re-engineered into Java or .Net applications. But Brown still needs Cobol programmers to replace those expected to retire, and the learning curve can last a year or more. That means adding staff and having a period of overlap as Cobol’s secrets get passed on to the next generation. “I’m trying to get those people on board and do the knowledge transfer sooner rather than later,” Brown says. But that kind of proactive approach, and the extra costs it incurs, can be a hard sell. “We haven’t gotten to the point of feeling the pain yet. When we do, it will happen,” he says. Brown wouldn’t specify the number of people he’s hoping to hire, but he says that the “real heavy need” will happen in the next five to 10 years, when the original mainframe programmers are expected to retire en force. BNY Mellon currently has “a few hundred” Cobol programmers on staff, Brown says. Trinity Millennium Group and other vendors like it have established processes for analyzing and extracting the business rules embedded between the lines of Cobol code. “The solutions have come a long way in terms of the ability to extract logic and rules,” says Burden. But the process is time-consuming and costly. One Millennium client recently spent $1 million to have its Cobol programs analyzed and business logic reconstructed as part of a migration project off of a mainframe. “If they had the legacy programmers there and we had done the exercise with them, it would have cost $200,000 and taken one-tenth of the time,” Garza says. If you wait until that institutional knowledge is gone, he warns, the costs can be as much as 10 times higher than it would have been beforehand. That’s the situation faced by Jim Gwinn, CIO for the U.S. Department of Agriculture’s Farm Service Agency. The USDA’s System/36 and AS/400 systems run Cobol programs that process $25 billion in farm loans and programs. “We have millions of lines of Cobol, and there’s a long history of it being rewritten,” he says. “It has become increasingly difficult to change the code because of the complexity and the attrition of the knowledge base that wrote it.” That’s a big problem because laws that govern farm programs change every year, driving a need to update the code to reflect those changes. Gwinn hired consultants from IBM, who concluded that rewriting the programs in a different language or rehosting them on a distributed computing platform would be complicated and costly. But the System/36 hardware had to go, so Gwinn decided to bite the bullet: The FSA will move off of its end-of-life mainframe systems by rewriting some of the code in Java and replacing the rest with packaged software from SAP. The anticipated exit of institutional knowledge and the resulting shortage of Cobol programmers were also primary drivers behind NYSE Euronext’s decision to re-engineer 1 million lines of Cobol on a mainframe that ran the stock exchange’s post-trade systems. While Cobol was dependable, it wasn’t viewed as maintainable in the long run. Steven Hirsch, chief architect and chief data officer at NYSE Euronext, cites the need to make changes very rapidly as another key reason the stock exchange abandoned Cobol. “Ultimately, the code was not easily changeable in terms of what the business needed to move forward. We were pushing the envelope of what it took to scale the Cobol environment,” he says. So NYSE Euronext rewrote Cobol programs that run its post-trade systems for Ab Initio, a parallel-processing platform that runs on Linux on high-end Hewlett-Packard DL580 servers. The new environment allows for more rapid development, and the rewrite also eliminated a substantial amount of unnecessary and redundant code that had crept into the original Cobol programs over the years. If a business’s Cobol code doesn’t need to change much — and many batch and transaction processing programs don’t — the code can be maintained on or off of the mainframe indefinitely. But that philosophy wouldn’t work for NYSE Euronext. “We are a rapidly changing business, and we needed to move faster than our legacy code,” Hirsch says. When it comes to hiring new Cobol programmers, Jonathan J. Miller, director of information systems and services for Saginaw County, Michigan, is struggling. “We’ve lost our systems programming staff,” he says. And like many government IT organizations that have suffered from budget cuts, he doesn’t have much to offer those in-demand Cobol programmers. Generous government benefits used to attract job applicants even though salaries were lower than they are in the private sector. Now, he says, “our pay hasn’t increased in eight years and benefits are diminished.” To fill in the gap, the county has been forced to contract with retired employees and outsource Cobol maintenance and support to a third party — something that just 18% of the respondents to Computerworld‘s survey said they’re doing today. Saginaw County found itself hemmed in by the complexity of its Cobol infrastructure. It has 4 million lines of highly integrated Cobol programs that run everything from the prosecutor’s office to payroll on a 46 MIPS Z9 series mainframe that is nearing the end of its life. With mainframe maintenance costs rising 10% to 20% each year, the county needs to get off the platform quickly. But commercial software packages lack the level of integration users expect, and Miller’s team doesn’t have the time and resources to do a lot of integration work or re-engineer all of the program code for another platform. So the county is starting a multiphase project to recompile the code with Micro Focus Visual Cobol and rehost it on Windows servers. An associated VSAM database will also be migrated to SQL Server. Miller hopes that the more modern graphical development suite will make the Cobol programming position, which has gone unfilled for two years, more attractive to prospective applicants. But he acknowledges that finding talent will still be an uphill battle. 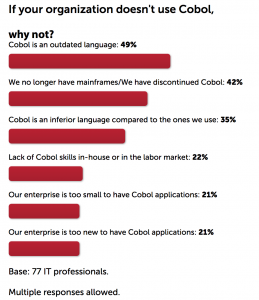 Is there a role for Cobol off the mainframe? “I don’t believe there is. Cobol and the mainframe run well together, and that’s where I want to keep it,” says Brown of BNY Mellon. But the bank is still creating new Cobol components on the mainframe, and it will continue to do so. If companies can’t find talent to keep that infrastructure going, third-party service providers such as Accenture are ready, says Burden. The scale of Accenture’s support operation is large enough to provide a career track for Cobol programmers, and he notes that it’s easy to cross-train programmers on the language. “We can turn out new programmers quickly. So if clients can’t support Cobol, we will,” he says. Robert L. Mitchell is a national correspondent for Computerworld. Follow him on Twitter at twitter.com/rmitch, or email him at rmitchell@computerworld.com.